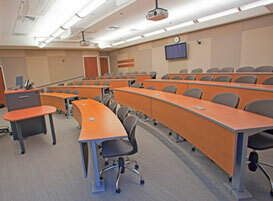 The Tiered Classroom seats 50 in a multi-level environment of 1,140 square feet. 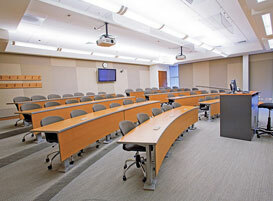 This space features built-in videoconferencing capability and contains two LCD projectors and screens, a computer, Wi-Fi, DVD and VHS players and a document camera. The dual screens allow for two distinct media streams: attendees can view a PowerPoint presentation and website simultaneously. Electrical outlets are well positioned on the desktop for easy access, and natural light streams through two windows.